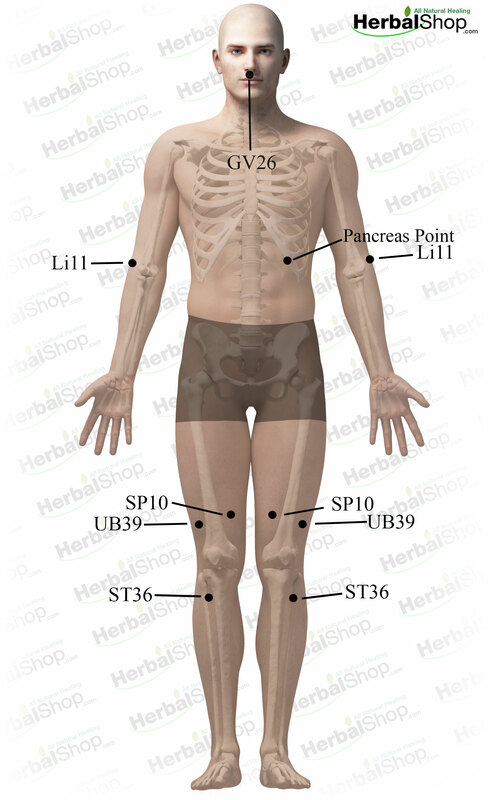 These are the acupressure points for diabetes. Working on these points can help you get better faster. You do not have to use all of these points. Using just one or two of them whenever you have a free hand can be effective. Location: below the nose, a little above the midpoint of the philtrum. in the hollow between the upper lip and the nose. Benefits: revival point from cardiac and respiratory arrest, mental disorders, epilepsy, convulsions, coma, facial paralysis, swelling of the face, low vitality, lockjaw, diabetes, fainting spells, chest pains, heart attacks, heat stroke, middle and lower back aches, spasms of the lower back, face lift point. Location: on the left side, 1 body inch lateral to NAET spleen point, on the lower border of the rib cage. Benefits: hypoglycemia, diabetes, sugar craving, poor digestion of sugar, heart burns and bloating after eating sugar and starches. Location: when the knee is flexed, 3 finger width above the superior border of the patella, on the medial side of the thigh. Feel for pain or tenderness at the spot. Benefits: uterine bleeding, irregular menstruation, painful menstrual periods, premenstrual symptoms, absence of periods in fertile women without pregnancy, skin disorders, eczema, hives, sores in the mouth, cold sores, diabetes, sea food poisonng, any blood poisoning, acne, boils, carbuncles, furuncles etc. On the skin, kidney infection, bladder infection, septicemia, anywhere in the body, aids, immune deficiency disorders, decreased white blood cells in the blood, blood diseases, leukemia, cancer of any type, thyroid disorders, pain in the knee, pain in the medial part of the thigh. Location: Four finger widths below the kneecap toward the outside of the shinbone. Benefits: Strengthens the whole body to prevent as well as relieve allergies. long life point, balancing point, to boost up energy, knee pain, gastric pain, vomiting, abdominal distention, diarrhea, constipation, dizziness, mental fog, mental disorders, schizophrenia, arterial sclerosis, poor digestion especially of proteins and carbohydrates, diabetes, breast abscess, mastitis, pain and swelling in the breast, side effects of radiation and chemotherapy. Strengthens and tones the muscles and improves the condition of the skin throughout the entire body.